Last flight Fuerteventura to Nuremberg landed 1.11am. Germania declared bankruptcy and ceased operations overnight on Monday February 4 2019. The Swiss and Bulgarian subsidiaries survived to fly another day. It was reported last month that the airline had suffered heavy losses in recent years, especially during 2018 and that its owners are seeking potential buyers for the airline. On January 31, it was reported that payment of employee salaries would be delayed. 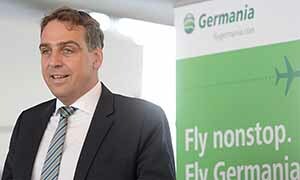 Germania eventually ceased flight operations without previous notice overnight from February 4 to 5 2019 and declared bankruptcy for itself and its technical and service divisions excluding Germania Flug in Switzerland. The airline was delisted from GDA at 2.40 on the evening of February 4. Talks aimed at securing finance with Joachim Hunold, Udo Stern and Jörn Hellwig failed at 1am. The final scheduled flight to be in the air was ST 3711 from Fuerteventura to Nuremberg which landed on 5th February at 01:11 AM. Originally focused on charter operations, in recent years Germania had moved towards becoming a scheduled carrier, although some charter flights were still flown under the brand. Germania offered chartered flights from German airports and scheduled flights to Armenia, Turkey, Kosovo, Israel and Lebanon. The airline has a fleet of 30 aircraft, nine of which were leased our of Ireland: 19 Airbus A319-100 (one each leased from Aercap, Amemtum, Avolon, AWAS, BOC, Gecas and Pembroke), six Airbus A321-200 (one each leased from Apollo and GECAS) and five Boeing 737-500. Full statement: Germania Fluggesellschaft mbH, its sister maintenance company Germania Technik Brandenburg GmbH as well as Germania Flugdienste GmbH filed for insolvency at Amtsgericht Berlin-Charlottenburg on Monday, February 4, 2019. Flight operations will be terminated in the night from February 4 to February 5. Germania’s employees have been informed. Swiss airline Germania Flug AG and Bulgarian Eagle are not affected by this step.